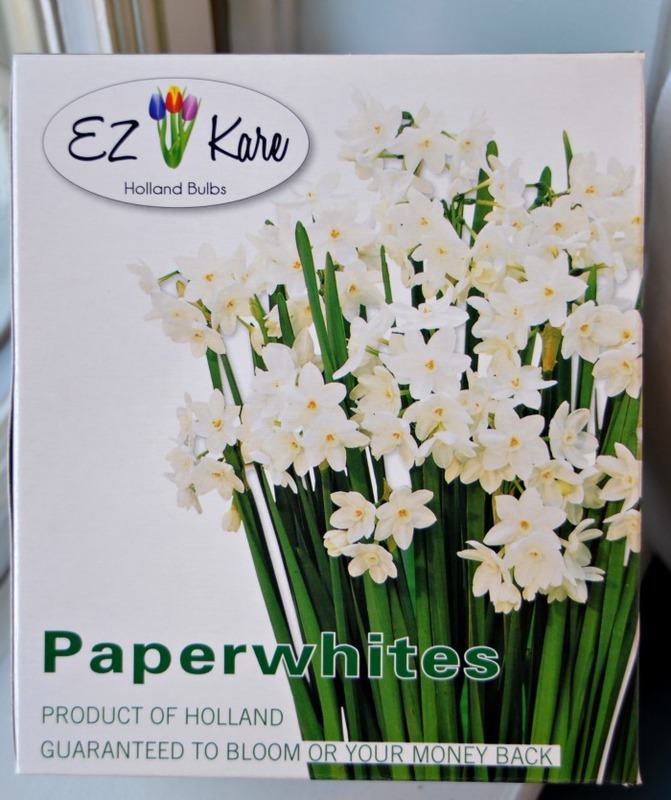 I recently wrote a sponsored post about planting bulbs and in particular paperwhites, and I guess the post worked because I went out and bought some paperwhite bulbs! LOL! While browsing at the Christmas Tree Shop, I found these planting kits and thought I’d give them a whirl. I admit it. The “guaranteed to bloom or your money back” sucked me in. If you’ve followed me for any amount of time, then you know I’m not the best gardner. But bulbs are fairly fool proof, so I’m remaining hopeful. Paperwhite bulbs are easy to plant. You simply submerge the bottom of the bulb 1/2-2/3 of the way down in your planting medium and keep them well-watered. This kit came with soil pellets that expand when you add water, but most people grow their bulbs in pebbles. You can expect blooms in 4-6 weeks after planting. 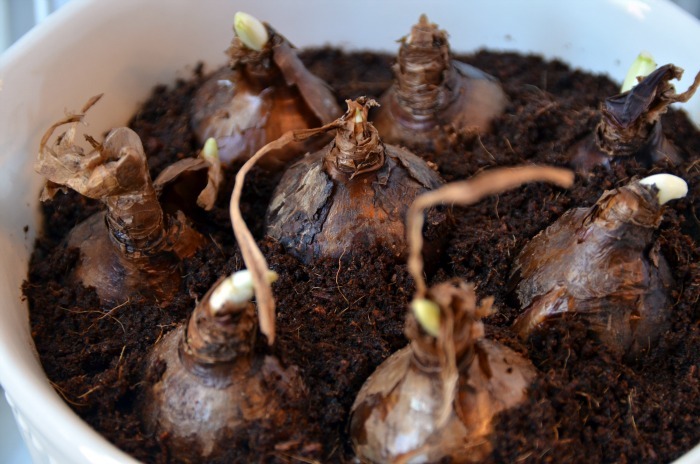 Did you know that you can actually grow your bulbs in almost any non-metal, non rotting item? Buttons, legos, army men, beads, etc. will all work. Just fill your container with water so that the bottom of the bulbs are wet but the entire bulb isn’t submerged. If the entire bulb is wet, your bulb will rot. 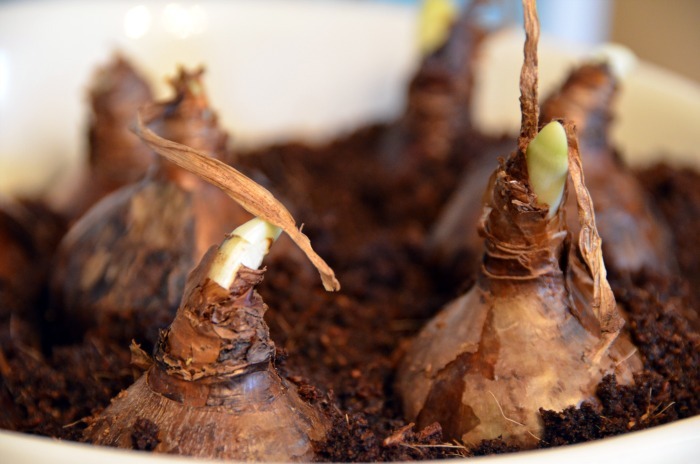 Some articles also recommended adding rubbing alcohol to your water solution once the bulbs root in order to stunt the growth of the paperwhites. The stems become very leggy and will most likely need to be staked if you don’t stunt the growth. I’m just hoping I can get a blooming flower from these babies, so I think I’ll wait and mess with the more advanced growing techniques another time! 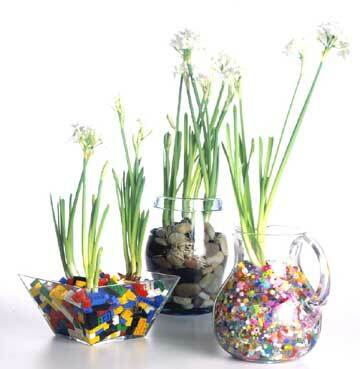 Choosing a unique container and medium to grow your paperwhites is all part of the creative fun! This picture below from Design Sponge gives some great ideas for various growing containers. I decided to choose this cute bowl that I typically use for baking as my planting container. I’ve placed the bulbs in my bedroom for now because it is the room that gets the best light, but I’ll move them downstairs once they bloom. 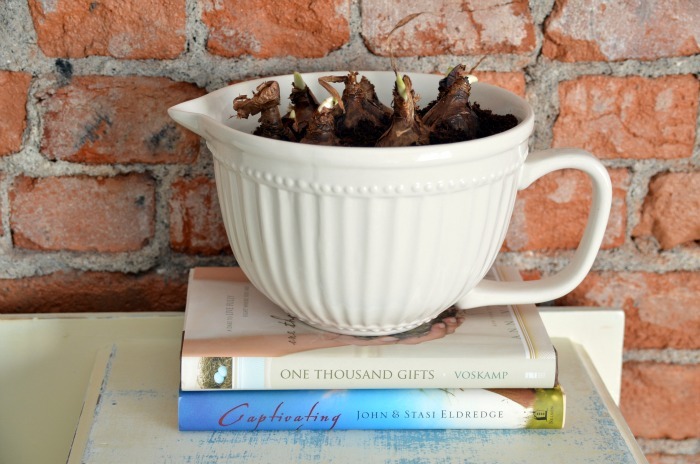 If you need a quick and easy gift for the neighbors, paperwhites are a good option. I’m trying to lose weight right now, so I will most likely be giving out bulbs rather than cookies this year :). 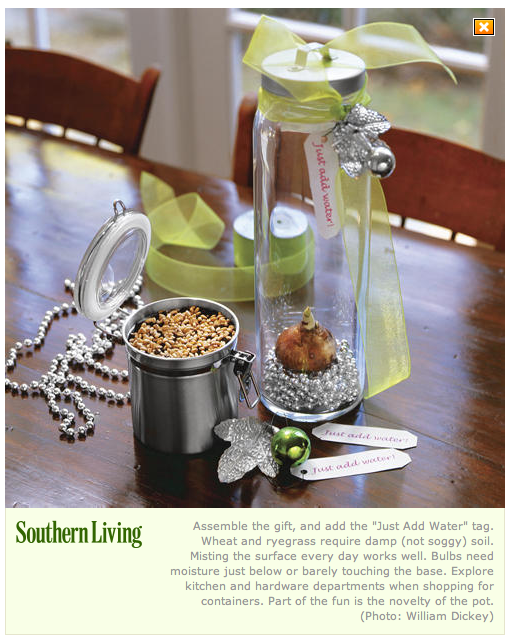 I love this cute packaging idea from Southern Living. That looks like a tall Ikea container to me that they used with the silver beads. So how about you? Do you have any experience in growing paperwhites? Any other tips to add? Pray that I don’t kill my bulbs, and hopefully I’ll have some pretty flowers to show you in a few weeks! I love love love Paperwhites! Have them every winter. And yes, I’ve grown them in any and everything I have in the house… never fail bulbs! A new favorite Christmas tradition at our house since they actually bloomed! Yours will look so pretty in that container. I better get mine going. HI! I have never tried this but have enjoyed seeing them in magazines, online, etc… They look stunning! Definitely going to try this….not allergic to any scents so hopefully they won’t get overpowering??? I think they’re beautiful too, but the smell, ugh!!! Total cat urine stink. Last year my family and I were so excited to watch them grow and bloom and then wham! It’s like, who tooted?… oh the paperwhite did. Seriously. I love the look of them though and still plant them from time to time for Christmas. I get more satisfaction from amaryllis bulbs. Google giving them a cocktail of vodka and water to make the stems stronger so they don’t fall over. You need to get the ratio correct and I don’t remember what it is. OMG I am so laughing at the cat urine comment & your reply….I have these outside and they grow like crazy! Years ago I forced a pot of paperwhites. Due to the smell my family banned me from doing it again. Now amaryllis are a different story they do not smell and produce beautiful blooms. What a stunning post! 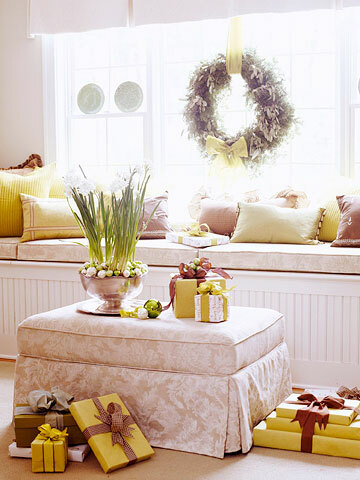 Paperwhites are by far my most favorite holiday flower and that fragrance sends me over the edge, yummm! I’ve always wanted to try this, because I absolutely love the look of paperwhites, but I’ve heard people complain about the smell as well. I’ll be curious to see what your experience is with that. Keep us posted! I love the look of paperwhites especially for Christmas when they look so good in gold spray painted pots or glass containers but for me the big drawback is that the flowers smell like cat urine. Oh no! I had read that they smell great. I cannot STAND the smell of cat pee so if these guys stink they’ll be going outside! I had a large bunch of them last year. While I certainly didn’t think they smelled like cat urine or ammonia or anything like that, the scent was definitely heady. A heads up if anyone in your family is sensitive to smells… but otherwise I didn’t think the scent was offensive in the least. Perfect timing! My son came home with this (already growing) from preschool today and I had never even heard of it. I certainly had no idea what to do with it, so thank you! Glad I could help Mary! You might look at http://www.theyellowcapecod.com/2011/11/holiday-home-series.html for more information about paperwhites. Thanks for sharing your creative ideas!